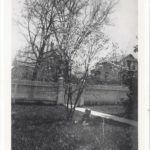 The McCall Magnolia was planted in 1890 in front of the renowned home of John M. and Mary Elizabeth McCall in memory of John’s daughter Elsie, who died in 1890. While a Southern Magnolia’s life span can be greater than 100 years, it is rare that this species can thrive in this climate for so many years. Recent photos show it towering over the grand home built by the McCall family in 1883. 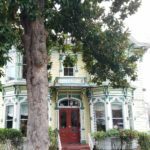 The McCall House still contains some of the original family furnishings and is a popular Ashland bed and breakfast inn. John was a founder of multiple business enterprises and served in many public service capacities including as Councilman and Mayor of Ashland, member of the Oregon State Legislature (1876), a Captain in the First Oregon Cavalry (1861), and Brigadier General of the Oregon State Militia (1865). Originally from Pennsylvania, he came to Oregon in 1850, prior to statehood. John began as a gold prospector but, realizing an opportunity, started offering wares and services to fellow miners, establishing the Ashland Mercantile. This was followed by various enterprises including the Ashland Woolen Mills, Bank of Ashland, Ashland Library, and the local newspaper, Ashland Daily Tidings, which is still published today. As Ashland’s mayor, John was instrumental in ensuring the railroad came to Ashland rather than Klamath Falls. He built his new home in sight of the railroad station, where it became the center of hospitality in Ashland. Married in 1868, John’s first wife Theresa Applegate was the mother of his children. 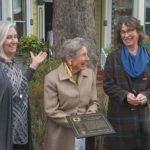 She was from a prominent pioneer family whose vast holdings inspired the naming of the lush and productive Applegate Valley, which encompasses miles of Southern Oregon farmland. Stretching from Medford to Grants Pass, the region is now known for its superior wine production. Additionally, beginning in 1846, many settlers coming to the Rogue Valley and Willamette Valley traversed the Applegate Trail, named for members of Theresa’s family. After Theresa’s death in 1875, John married Mary Elizabeth “Lizzie” Anderson in 1876. She had traveled by oxcart from Missouri and became a local teacher, and was the adoptive mother of her niece, Anna. After their marriage, Lizzie parented John’s children including Elise, for whom the magnolia was planted. Lizzie continued an interesting life after John’s death in 1896. She became postmistress of Ashland and the first telegraph operator in Southern Oregon. She ran both the post office and telegraph office out of the front parlor of the McCall House, keeping watch over the growing magnolia tree. She was an active suffragette until her death in 1912.